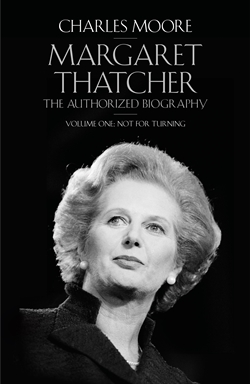 Not For Turning is the first volume of Charles Moore’s authorized biography of Margaret Thatcher, the longest serving Prime Minister of the twentieth century and one of the most influential political figures of the postwar era. Charles Moore’s biography of Margaret Thatcher, published after her death on 8 April 2013, immediately supercedes all earlier books written about her. At the moment when she becomes a historical figure, this book also makes her into a three dimensional one for the first time. It gives unparalleled insight into her early life and formation, especially through her extensive correspondence with her sister, which Moore is the first author to draw on. It recreates brilliantly the atmosphere of British politics as she was making her way, and takes her up to what was arguably the zenith of her power, victory in the Falklands. (This volume ends with the Falklands Dinner in Downing Street in November 1982.) Moore is clearly an admirer of his subject, but he does not shy away from criticising her or identifying weaknesses and mistakes where he feels it is justified. Based on unrestricted access to all Lady Thatcher’s papers, unpublished interviews with her and all her major colleagues, this is the indispensable, fully rounded portrait of a towering figure of our times.